DIFFERENT TRAINS GALLERY, 432 East Howard Avenue no. 24, will present something a little different this autumn - a collaborative art exhibition/storytelling/musical performance conceived and written by Natalie Twigg, an extraordinary English-born, Atlanta-based composer & musician. “The Gallery” is a poignantly beautiful story of searching and renewal, as layer upon layer of the tale weaves within Twigg’s evocative music. Think Alice in Wonderland meets Bach. The story is set in a theatre with twelve pieces of artwork taking centre stage. Natalie enlisted her friend, artist Todd Alexander, to create the twelve original works of mellifluous art, making a powerful audio and visual collaboration inspired by the biblical character, Bathsheba. "The Gallery" will open in two parts, the first being the Premier Concert Performance by Twigg on Friday, October 26, 7:30 pm at Holy Trinity Parish, 515 E Ponce de Leon Ave, Decatur. On the following Friday, November 2, 5-8 pm, the exhibition of Todd Alexander’s art will open down the street at DIFFERENT TRAINS. Visitors to the gallery will get to hear a recording of Twigg’s performance while viewing the show. Twigg won a scholarship to the Royal College of Music at the age of 18 and studied the oboe with highly acclaimed soloist Sarah Francis and the cor anglais with Christine Pendrill of the London Symphony Orchestra. She has performed throughout Europe and the US with orchestras & chamber ensembles, as well as jazz and rock bands including Led Zeppelin. She has performed solo recitals at venues such as St. Martin-in-the-Fields and has played for both the Royal Ballet and the British Royal family on several occasions. She was commissioned to write and record a lullaby for Princess Catharina Amalia of the Dutch Royal family and has contributed to BBC Radio 2's Good Morning Sunday. Shortly after emigrating to the US from England, Natalie co-founded a 6-piece jazz/world fusion ensemble, Aurora Consort, based in Kansas City. Todd Alexander was at the heart of the 1990s/early 2000s Atlanta Mattress Factory scene of studio artists, which included local favorites such as Todd Murphy and Tony Hernandez. His expressive and imaginative works are not only a fitting accompaniment to Twigg’s story, they showcase an artist at the height of his game. After decades of making art & exhibiting in Atlanta, Todd decided to slow things down a bit and move to Amelia Island on Florida’s Atlantic coast. The new environs, along with Twigg’s inspiration, seem to have had a happy effect on what may be some of his most intriguing work yet. Natalie invites the public to attend any or all of a series of open rehearsals that will take place on the Fridays of September 28 and October 5, 12 and 19 from 12-1 pm at the sanctuary inside Holy Trinity Parish, where she has a studio residency. Admission is free and childcare is available. 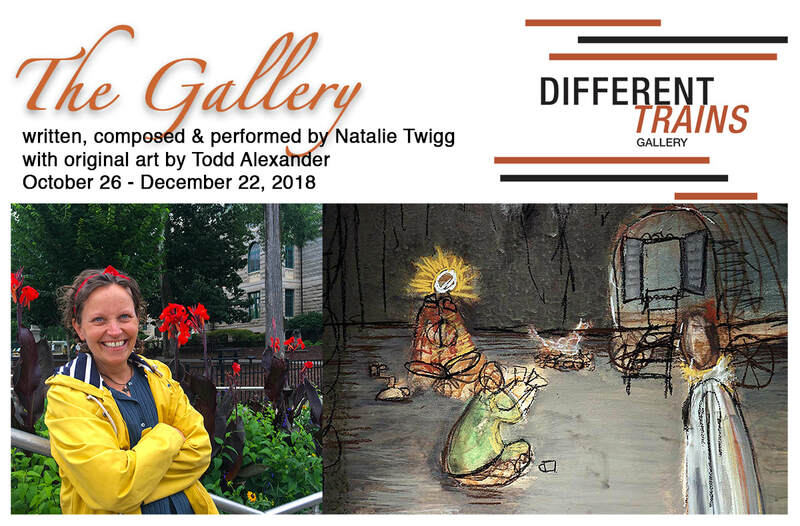 On Friday, October 26, at 7:30 pm, Natalie will open the premier concert performance with her oboe improvisations and then perform "The Gallery", narrating the story from her piano. A week later, on November 2, 5-8 pm, "The Gallery" art exhibition will open at DIFFERENT TRAINS GALLERY. "Both stirring and serene, Natalie's music draws you into the arc of her stories. And as you listen, you hear your own story as well"
"There is a lot going on in this complex new work by Natalie Twigg, and she carries it off seemingly effortlessly. Twigg tells an intricate story with charm and skill, while juggling voice, piano and the evocative paintings of Todd Alexander. You'll be humming bits of it as you leave. Great stuff." "Stunning.... Natalie's compositions have a unique charm and ethereal quality which touches the soul." "Natalie Twigg is not only a gifted oboe player, but has been able to use her talents in music that is both meaningful and captivating. It is original without being difficult to understand, and the performances are always of the highest standard." "Every now and then you meet someone who is a complete ‘one off’ and Natalie Twigg is one of those people. Whatever she's up to you know it's going to be interesting and well worth a look, or a listen, or both. She's a girl you don't meet everyday."